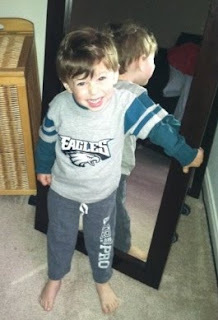 Being a stay-at-home-mom does not mean that you stay at home. Gone are the days that I could snuggle my 3 week old on the couch and alternate between singing him lullabies and watching Regis and Kelly. Keeping up with a toddler is like a Choose Your Own Adventure book. So when it’s 7:50 am, and it’s raining out, and Max has the tail end of a cold….there’s nothing left to do but be creative. 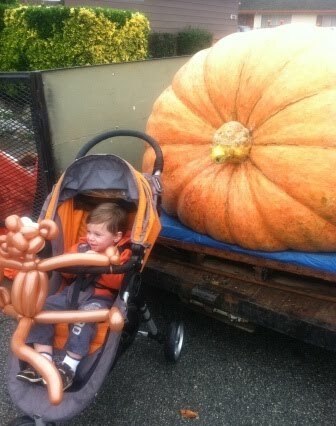 So we bundled ourselves up and went off in search of the Great Pumpkin of 2011. Thank goodness there was a parade of these Jolly Giants right down the street this morning. 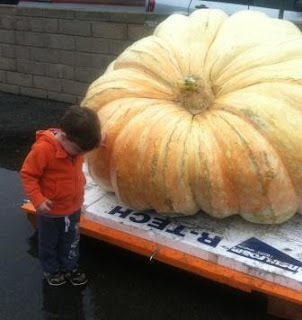 I mean, we do live in the Pumpkin Capital of the World, y’all. 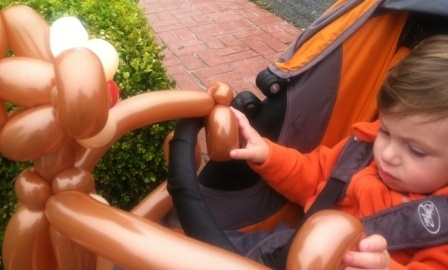 We picked up a balloon monkey on the way…. and polished off our downtown stroll with a Pumpkin Spice Latte for Mommy and a bagel for Max. In true “adventure” fashion, the rain started pouring down on us when we were about 3 blocks from the car. I suppose that’s how the memories get made. One soggy balloon monkey at a time. The measure of my Mommy Success today came when a tiny, sneezy voice from the backseat yelled out “More big pu-in!” as I turned the corner toward home, naptime, and the next six hours of undiscovered adventures.